How Blockchain Technology enhances Supply Chain Management? Blockchain, the technology is reverberating through today’s markets for its unique features and its epitome of security for storing data. For starters, Blockchain is a distributed database that holds records of digital data. It is immutable, secured and goes through various levels of trail on the information stored in the blocks. The blockchain technology is affecting multiple industries one at a time. In this blog post, we will see in detail how blockchain technology is enhancing Supply Chain Management. The traditional Supply Chain Management is the link connecting the product’s creation to the delivery of the goods to the end customer. Irrespective of the product, the supply chain spans countless stages, various international locations and a mountain heap of invoices and payments to be dealt with. This is very complex, to say the least, and to retrieve a single piece of information might be a nightmare. And the logistics itself is an obscure mirror. If the supply chain of a company is global, then the issue of reaching out to customers is a roadblock. Another problem is the inefficiency of vendors and suppliers in every checkpoint where the chances of human errors, time delays, and ordering costs are increased manifold. The original purpose of the blockchain was to store the transactions done by Bitcoins. However, the inclusion of excellent features has made blockchain highly desirable. Blockchain has entered the SCM to address the current supply chain that is lacking the essential transparency. From Warehousing to deliver to payment, the obscurity is eliminated with Blockchain technology. The level of the supply chain may vary in scale from one company to another. No matter the size and extent of the supply chain, Blockchain can allow the seamless exchange between multiple entities on a single platform. These entities can be accessed from any node like OEM, Suppliers, end customer and much more. As blockchains are permissioned, it allows the participants to exercise authority over the validation of blocks of transactions and data. Blockchain helps in synchronizing ledgers in real-time so that updates done in any block can be reflected immediately and cannot be manipulated at given time. And any chances of manual errors are also significantly reduced as the entry of the data is automated and validated continuously. Some supply chain giants who are in service with industries like BHP Billiton, the world’s massive mining firm has started using blockchain to track and record data throughout the mining process and its subsequent delivery. This will increase efficiency and eliminate any chances of errors. A supply chain management of any scale is no easy feat. Blockchain may ease the process with the right set of features associated with it. 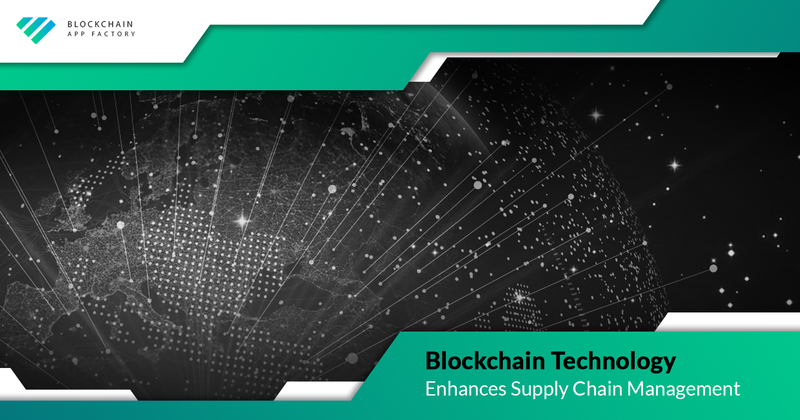 To make the full use of the Blockchain technology in supply chain management, Blockchain App Factory provides enterprises with unrivalled SCM with its foundation in Blockchain. A Smart Contract is a used in SCM, as the contract is fully automated and only executes when the pre-defined set of conditions are met by two concerning parties. This established trust in the contract. With attributes such as cryptographic ledgers, proof of origin and shared datasets created by Blockchain App Factory will be on point. The Blockchain App Factory’s SCM solution will be unsurpassed in the field and will help your supply chain management devoid of any hassles.